These delicious grilled cheese sandwiches with caramelized onions are easy to make, especially if you make the caramelized onions ahead of time. Make a batch and keep in the fridge for 3 to 4 days. You can add them to everything from meatloaf to scrambled eggs. We like to add sliced garlic to the onions during the last 5 minutes of cooking time for another layer of flavor. 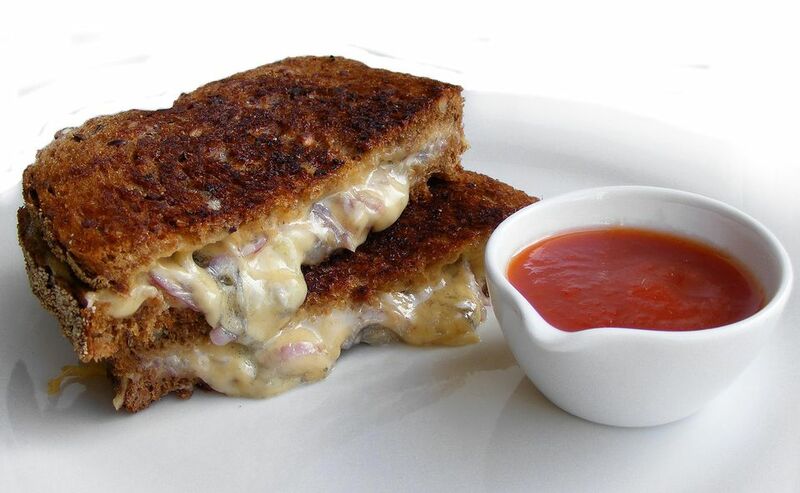 There's nothing better or more satisfying, or simpler to make than a grilled cheese sandwich or any hot sandwich. These recipes can be changed any way you'd like. Use a different bread, a different cheese, more cheeses, or add veggies such as sliced tomatoes, sautéed bell peppers, or spinach or other greens. You could also add some sautéed apples or pears for a sandwich reminiscent of fall. Add some crisply cooked bacon or thinly sliced ham for a fabulous variation. If you change the recipe, write down the changes so you can reproduce your masterpiece. These easy sandwiches can be served with nothing but a cold glass of milk, but you could add a green salad or a fruit salad for a complete meal. Combine the onions, olive oil, and butter in a heavy skillet. Sauté over medium heat, stirring frequently until onions start to brown, about 10 minutes. Reduce the heat to low and cook, stirring occasionally, until onions become golden brown, about 15 to 25 minutes longer. Toward the end of the cooking time, watch the onions carefully and stir more often so they don't burn. Sprinkle the onions with sugar, salt, and pepper, cook for another 2 to 3 minutes, and remove from the heat. Let the mixture cool, then store, covered, in the fridge for 3 to 4 days. You can freeze caramelized onions for longer storage, up to 3 months. To thaw, let them stand in the fridge overnight. To make sandwiches, place the bread on a work surface. Top four slices of the bread with a slice of cheese, then spread with a few spoonfuls of the caramelized onion mixture. Top with another slice of cheese. Top with remaining slices of bread to make four sandwiches. Spread the outsides of the sandwiches with the softened butter. Grill sandwiches, covered, until toasted, turning once over medium heat, or cook them on a panini grill or dual contact indoor grill. Serve immediately.